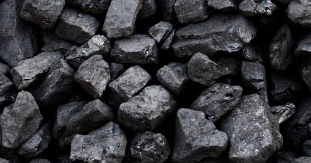 Coal is a readily combustible rock containing more than 50 percent by weight of carbonaceous material formed from compaction and indurations of variously altered plant remains similar to those in peat. After a considerable amount of time, heat, and burial pressure, it is metamorphosed from peat to lignite. Lignite is considered to be "immature" coal at this stage of development because it is still somewhat light in color and it remains soft. Lignite increases in maturity by becoming darker and harder and is then classified as sub-bituminous coal. After a continuous process of burial and alteration, chemical and physical changes occur until the coal is classified as bituminous - dark and hard coal. Bituminous coal ignites easily and burns long with a relatively long flame. If improperly fired bituminous coal is characterized with excess smoke and soot. Anthracite coal is the last classification, the ultimate maturation. Anthracite coal is very hard and shiny. 1) Volatile matter - dry mineral matter free basis. In coal, those products, exclusive of moisture, given off as gas and vapor determined analytically. Anthracite coal creates a steady and clean flame and is preferred for domestic heating. Furthermore it burn longer with more heat than the other types. Engineering ToolBox, (2003). Classification of Coal. [online] Available at: https://www.engineeringtoolbox.com/classification-coal-d_164.html [Accessed Day Mo. Year].